This document will take you through the full setup process. You will need Admin access to MINTclass to complete the setup. The icons used for the Behaviour module will have been chosen by your schools SLT during the technical set up stage. Log into MINTclass and select Cortex then select the Config tab. 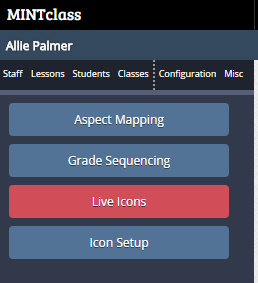 Now click on the new Live Icons button. The first part of the setup that you need to complete is the Configuration - this could be for the whole school if you have the same behaviour and achievement codes for all years. You could set up a Configuration for a Key Stage or even by Year Group. For the purpose of this document, we will set up a Whole School Configuration. Click on Configuration Control.Enter the name of your Configuration and then click on Add Config - for example Whole School. Now you have added the first Configuration you may need to add a second and even a third depending on your school's behaviour policy. Type the name of the second Configuration and then click on Add Config. 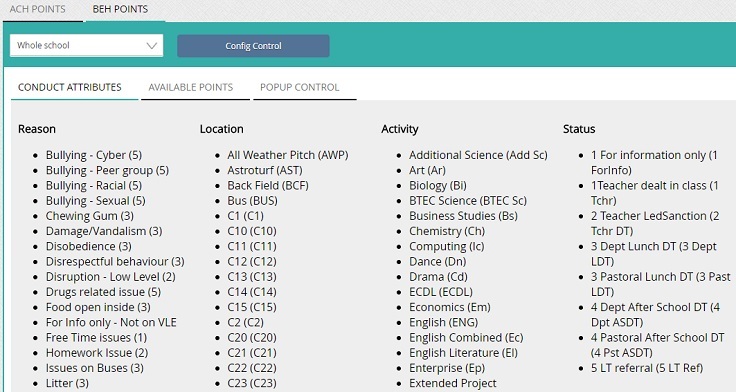 You will now need to select the year groups that these are defaults for - for example when you add a point to a KS3 student by default, you want the KS3 config to be displayed for staff to chose from. 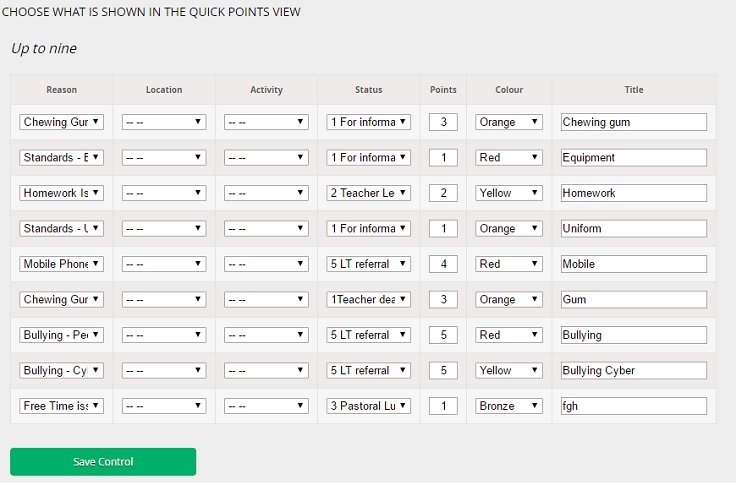 We automatically pull all the Behaviour and Achievement information from your schools MIS. The information is displayed within the Ach Points and Beh Points screens. Below you can see the information for Behaviour. By default, you are taken to Achievement Points but you can select Behaviour Points at the top of the screen if you wish to set those up first. For the purposes of this document, we will set up achievement points first. This allows you to control how many points a teacher can add to a Behaviour or Achievement reason. If a reason has points allocated to it in SIMS then the points are automatically attached to the reason in MINTclass. If no points values have been added to a reason in SIMS then you need to decide which points values are available to staff. Click on the Available Points tab at the top of the screen. For training purposes, we have selected to use 1, 2, 3, 4 and ? - this means that staff can allocate a point from 1 - 4 or have a free choice. The ? donates a free choice. Again, this should align with your school's behaviour policy. Click on Save Available Points. The next step is to set up how MINTclass displays the behaviour and achievement pop up to staff when they add them. There are a number of options here which you need to consider. Click on the Popup Control tab. 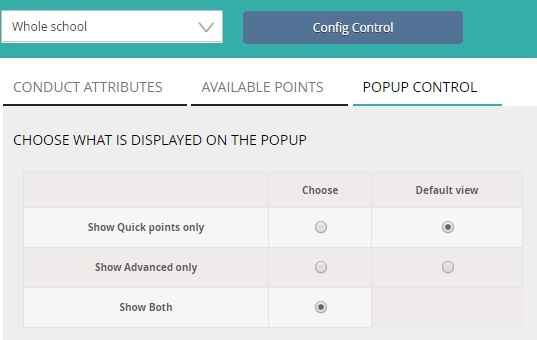 The first thing you need to decide is how the pop-up is displayed. We suggest that you choose Show Both as this will allow staff to select from either a Quick Point or any reason. Select the option that you want to see. If you choose Quick Points you will now need to choose which quick points you wish to display. You can choose up to 9 per Configuration. Select the Reason from the first drop down then you can choose to add a default location, Activity and Status (remember there are different options for Behaviour and Achievement). If there are points associated with the reason within SIMS the points box will auto fill. Finally, choose a colour for the icon. Repeat until you have created all the quick points that you wish. Congratulations - you are now set up - Take a look at the using and reporting pages. If you have any questions, please email support@mintclass.com.